Chances are you’ve heard at least some buzz surrounding the latest generation of wireless QI chargers. Not only are these go-to chargers increasingly portable and versatile, but given their sleek look and wireless charging capabilities, consumers are scooping up these must-haves for home, office and on-the-go use. Consider these chargers the Pringles® of the marketing world — you can’t have just one. We’re seeing consumers pop wireless chargers into convenient and high-traffic spots from their own bedsides, desks and cars to conference rooms, waiting rooms and reception areas. By having a wireless charger within arm’s reach at all times, your customers never have to worry about a low battery or being phone-less when they’re out pounding the pavement. And, for your business, that means more opportunities to be front-and-center, delivering a high-value service when customers need it most. Science Alert recommends consumers “plug in your phone whenever you can,” since smart phone batteries “are much happier if you charge them occasionally throughout the day…” It’s good advice and another good reason for your business to brand these wireless chargers. Think about it: consumers charging their phones throughout the day means constant, ongoing exposure to your brand and your brand message. Every time she “plugs in” she’ll catch a glimpse of your branding, deepening the relationship and tying you back to serious value — you did get her phone back up to 100%, after all. Taking this a step further… think about that consistent interaction versus traditional digital and mail pieces. The average consumer spends two seconds with an email — it’s no contest. Even with a direct mail piece which, on average, has a 17-day lifespan, pales in comparison. Traditional phone chargers are one-notes — you can charge your phone but, likely, nothing else. Not so with our wireless QI chargers which can fuel iPhone® 8, iPhone X and most Samsung® cell phones, plus virtually any device with a compatible adapter. This instantly makes these chargers the perfect addition to any office or high-traffic setting — again, think waiting rooms, break rooms and reception areas. In other words, places lots of other people frequent — and places lots of other people will see your brand messaging. With this added versatility, then, it’s easy to expand your reach with no added investment or engagement. It’s a win/win — your brand gets massive exposure without a massive incremental investment. And who knows? That client-of-a-client juicing up their phone on your wireless charger could drive a lucrative partnership in the not-too-distant future. When Apple® rolled out QI charging for its iPhone 8 and iPhone X, the demand spiked and countless consumers were introduced to these powerhouse chargers for the very first time. The end result: you couldn’t miss the wireless QI chargers at CES this year, with consumers, media and tech influencers vying to get their hands on the latest and greatest. In short, everyone wants one of these chargers, and, with our custom branding opportunities, you’ll have the opportunity to be the business that delivers. So, there you have it! 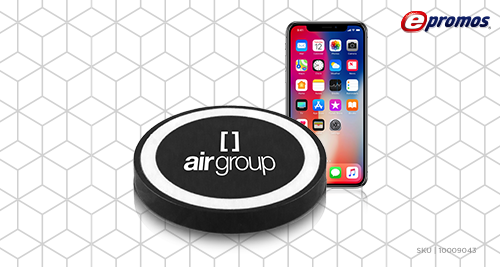 Check out our Qi Wireless Custom Phone Charging Pad and call us to start planning your next campaign now!